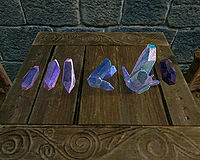 Empty soul gems can also be harvested from Geode Veins (only found in Blackreach), resulting in 2–3 gems of any size, including Black Soul Gems. The Black Star none 00063b29 0 1000 3000 (Grand) 6200 (caps at 3000) Can be used to capture a humanoid's soul, and will not break on use. Soul gems are consumed upon being used to recharge a weapon. This is one reason why it is a good idea to fill your soul gems as efficiently as possible (i.e., Grand Gems for Grand Souls, Common Gems for Common Souls, etc.). A soul gem not being used to its fullest capacity could be considered a waste (losing a Grand Soul gem because you used the Petty Soul contained within to recharge a weapon, for example). However, see the Bugs section for a way to empty a soul gem non-destructively. With the exception of Grand and Black gems, soul gems filled yourself do not change in value from the "none" value to their filled value (ie. a Common Soul Gem valued at 50 when empty, will also be valued at 50 with a soul in it, even though a Common filled Soul Gem purchased from a shop is valued at 150). As of version 1.9, soul gems from Greater down to Petty that you fill yourself still do not stack correctly in inventory. Manually filled gems do not increase their value (with the exception of Black and Grand Soul Gems filled with Grand Souls). Soul gems you filled yourself may become emptied if dropped, or if transferred to a follower or container. This happens even when properly filled with correctly sized souls. This is exploitable to clear out an unwanted soul (e.g., a Petty Soul in a Greater Soul Gem) without losing the soul gem itself. This issue has been addressed by version 1.0 of the Unofficial Skyrim Patch; only gems not filled to capacity will empty when dropped; fully filled gems will not lose their charge.